Basset Hound Characteristics: The faithful and amicable Basset Hound is a breed of medium sized dog, classified as a member of the Hound Dog Group (AKC:1885), a Scenthound. The Basset Hound, is characterized by its strong, short legged relatively heavy appearance with a medium sized, domed head and placid, soft expression. Other characteristics include light, lozenge shaped, light eyes; long, pendulous velvety ears; a long, deep back and a smooth, powerful gait. The temperament of the Basset Hound can be described as Devoted, Tenacious, Gentle. The coat type of the Basset Hound is described as short and smooth coat in assorted colors. Due to its characteristics and qualities, the Basset Hound demonstrated the desired traits of a Hunting Dog and is known by its nick name the "French Aristocrat". The origin of the Basset Hound dog breed was in France where it was developed in the 6th Century. Basset Hound Breed Group and Dog Type - Hound Dog Group (AKC:1885), a Scenthound: The Basset Hound is one of the many breeds of dogs that belong to the Hound Dog Group (AKC:1885), a Scenthound. Other names for the Basset Hound: The Basset Hound is known by the nickname of the "French Aristocrat". Other names for this breed of dog include the Basset and Hush Puppy. Origin of the name: The origin of the name "basset" derives from the from Old French word 'bas' meaning "low" (as in low to the ground) in reference to the hounds short legs. Basset Hound - Scent hound: The Basset Hound is a Scent hound, one of the hunting dog breeds, built for endurance, with deep, open nostrils that enable the canine to pick up scent particles and track small and large game, especially badgers, bear, hare and rabbits. Basset Hound History and Origin: The country of origin of the Basset Hound breed was in France during the 6th Century. There were originally three main strains of the French Basset Hound; the Lane, the Couteulx, and the Griffon. The Griffon Basset had a hard bristly coat, and short, crooked legs. The Lane Basset hound were lemon and white with bent legs. The Couteulx hounds had a short and smooth tricolor coat, with straight, short legs. The Couteulx Basset hounds a sounder constitution than the other strains and were generally of a more agile hound. It is from the Couteulx strain that the modern day Basset Hound has evolved. The first mention of the Basset Hound appeared in a French hunting text published in 1585. The Basset Hound dogs were ideal for those who hunted on foot because they tracked small game at a slow pace. Following the French Revolution (1789 - 1799), the Basset Hound was used as a Peasant's dog, typically used to hunt rabbit and hare. The Basset Hound was also used to track wild boar, wolf, and deer. The Basset Hound was also less frequently used in the lighter pastimes of pheasant and partridge shooting. The Basset Hound was exported to England and the United States in the late 1800's. The Earl of Onslow and Sir John Everett Millais were among the earliest importers of the breed into England from the kennels of Jean-Emmanuel Hector, Count Le Couteulx de Canteleu (1827 - 1910). The first Basset hound was exhibited at an English dog show, at Wolverhampton in 1875. A class was provided for the Basset Hound by the Kennel Club in 1880 and the Basset Hound was officially recognized by the American Kennel Club (AKC) in 1885. 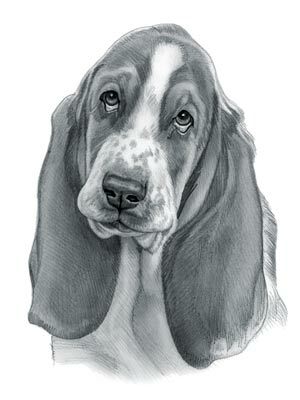 Basset Hound - The Hush Puppy Dog : The Basset Hound is famous in the 1950's as the symbol of the Hush Puppies™ brand of shoes. At this time the American slang phrase "my dogs are barking" was used to mean "my feet are hurting". Barking dogs were quietened with corn fritters called "hush puppies" and the name was adopted to describe a range of comfortable shoes. The Basset Hound featured in advertisements publicizing the brand which became hugely popular across the world. Basset Hound Height: The Basset Hound breed is classified as a medium sized dog. The height to the shoulder of a male dog is 12-15 inches (30-38 cm). The height to the shoulder of a female dog is 11-14 inches (28-36 cm). Basset Hound Weight: The weight of the male in this medium sized dog is 50-65 pounds (23-29 kg). The weight of the smaller female dog is 45-60 pounds (20-27 kg). Basset Hound Coat Type: The coat type is described as a short and smooth coat. Basset Hound Coat Colors: The colors of this dog breed consist of assorted colors consisting of Brown & White, Black & White, Red & White, Lemon & White, Black & Brown, Tri-color often with distinctive white feet. N.B. The term "Red" refers to reddish shades of orange, brown, and tan colors. Basset Hound Grooming - MODERATE Grooming Needs: The dog grooming needs of the Basset Hound is not extensive and therefore categorized as Moderate in order to maintain a healthy coat, reducing the risk of skin infections. The modest grooming needs of the Basset Hound is considered to be mid-maintenance requiring weekly brushing and combing. Dog Grooming Requirements should include bathing the dog on a monthly basis and making regular inspections of the teeth, eyes, nails and ears. Basset Hound Litter Size: The litter size of this dog breed ranges from 6-8 puppies. Basset Hound puppies for sale can be obtained reputable breeders and from rescue centers. The cost of Basset Hound puppies varies depending on location, pedigree history and the dog breeder. Basset Hound Temperament and personality: The temperament and personality of this popular dog breed is described as Faithful, Devoted, Tenacious, Gentle and Amicable. Basset Hound Exercise Requirements - MODERATE Exercise Requirements: The exercise requirements of this breed of dog are moderate. The Basset Hound requires regular daily exercise consisting of about one hour every day. This medium sized dog has a smooth, strident gait with strides of a moderate length requiring a steady walking or jogging speed by the owner to meet the dogs exercise requirements. If the dog has more energy than you do, then teach your dog to play ball in a chase and catch game. Basset Hound Diet: A fully grown Basset Hound should be fed twice a day. A diet consisting of a premium dog food can be balanced with fresh food eaten by the family. The question is What Can Dogs Eat?. Check out our comprehensive list of what dogs can and what dogs cannot eat. Basset Hound Health Problems: Potential health problems of the Basset Hound breed include Patellar Luxation, Hip and Elbow Dysplasia, Entropion . Resolving health problems can prove to be expensive and it is always wise to obtain pet insurance or dog health insurance when buying a dog. Is the Basset Hound dog breed said to be Hypoallergenic? Answer: No. Basset Hound Lifespan: The life expectancy of dogs vary according to the size, breed of dog and any serious health problems. The typical lifespan of the Basset Hound breed is 12-15 years. Basset Hound Male Dog Names: Male Dog names are most often chosen to reflect favorite names of the owner or the strength, size, coloring and country of origin of the Basset Hound breed. To give you some inspiration regarding good male Basset Hound names our small selection might be of help with naming boy dogs. Our top male dog names are: Goober *** Harry *** Mite *** Sammy *** Zeus *** Peanut *** Sam *** Dash *** Inch *** Jake *** Titch. Basset Hound Female Dog Names: Female Dog names tend to be softer, prettier and reflect the temperament of the girl dog. Our top choice of good female Basset Hound names are Cutie *** Twiggy *** Girlie *** Bambi *** Maddy *** Princess *** Lovedy *** Bonnie *** Hiccup.